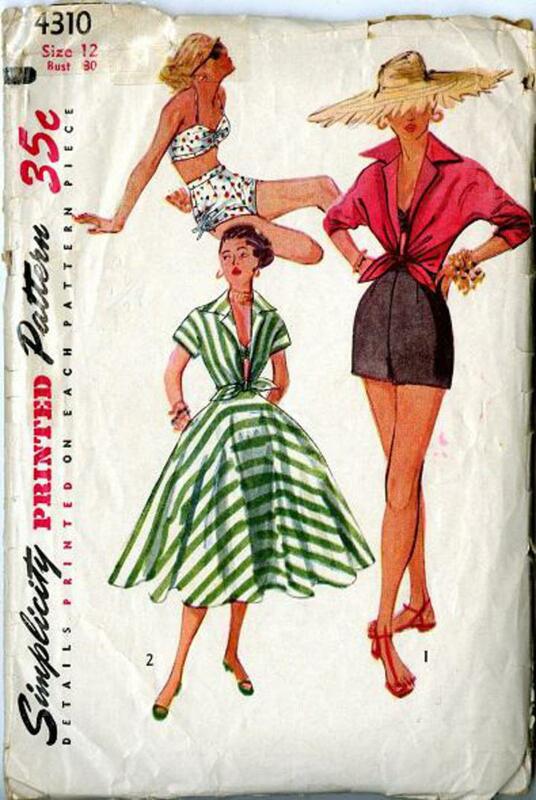 1953 Simplicity #4310 vintage sewing pattern, junior misses' shorts, bra, skirt and shirt, size 12. Shorts are joined to a waistband and have a back zipper closing. Drawstrings at side seams are optional. Bra is styled with gathers at center front, band at lower edge and back button closing. Skirt is a full circle and pockets in side seams are optional. Shirt features kimono sleeves, a notched collar and ties ends fastening at center front. There are NO INSTRUCTIONS INCLUDED and is intended for an advanced sewer, sold AS-IS.